1. How many biological replicates do I need for each condition? We suggest you to submit at least 3 replicates per sample to increase confidence and reduce experimental error. Note that this only serves as a guideline, and the final number of replicates will be determined by you based on your final experimental conditions. 2. What advantages does NGS have over Microarray? i. RNA-Seq is a sensitive tool for gene expression profiling. Compared to microarray, RNA-Seq offers a digital read that is more accurate for all gene expression. ii. Microarray can only offer limited gene expression information (i.e., the genes incorporated into the chip), whereas NGS is a more comprehensive approach that yields additional information for novel gene variants and low-abundance transcripts. iii. NGS produces far more reproducible and reliable results than microarray. It is not necessary to conduct qPCR after RNA-Seq, whereas it is a standard procedure for microarray to verify results. 3. When is it necessary to eliminate rRNA before sequencing? Ribosomal RNA (rRNA) constitutes more than 90% RNA species in total RNA. Performing RNA-Seq without Poly-A enrichment or rRNA depletion will generate reads that mostly come from rRNA. For example, less than one-tenth reads would be useful information. Transcriptome that has been rRNA depleted is often considered as total RNA, including both mRNA and non-coding RNA. Therefore, Poly-A enrichment or rRNA depletion is necessary for any sequencing platform. 4. Can RNA-Seq be conducted in prokaryotic species without available reference genome? It’s better not. 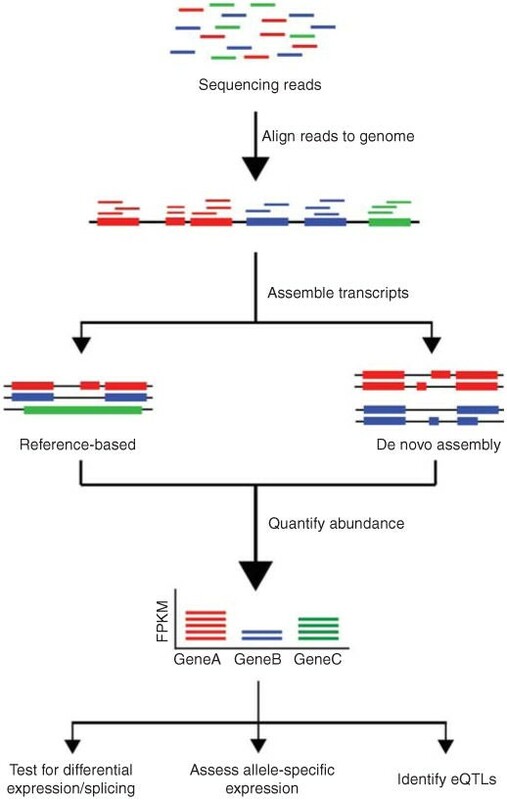 Prokaryotic species generally require reference genome for transcriptome analysis, since the mRNAs in them are usually polycistrons that do not suit for de novo assembly. 5. What is the conventional pipeline for RNA-Seq data analysis? The conventional pipeline for RNA-Seq data includes raw data quality control, alignment, assembly, gene expression profiling, and other analyses. Figure 1. Overview of RNA-Seq data analysis (Kukurba and Montgomery 2015). 1. Kukurba K R, Montgomery S B. RNA sequencing and analysis. Cold Spring Harbor protocols, 2015, 2015(11): pdb. top084970.